This delightful children’s story, beautifully illustrated, with original watercolors takes place in the California Marin headlands at the turn of the last century. It tells the story of a young farmer’s daughter, Maria, whose favorite calf wanders away from her parent’s dairy farm the night before the Holy Ghost Festa, and Maria becomes lost herself looking for the calf. During her overnight escapade, Maria reminiscences about her home country in the Azores, the family and friends left behind, and her long and hazardous ocean crossing from the Azores to California. 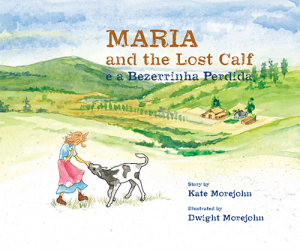 This first children’s book from Portuguese Heritage Publications of California, with text in both English and Portuguese – provides a vivid account of the historic presence of the Portuguese-Azorean dairy farmers in Southern and Western Marine County. This book is appropriate for children ages 2 to 12, both as a redo-to, and as an early primer in both English and Portuguese. Maria and the Lost Calf is the ideal gift for your children, grand-children and other young members of your family. The author and illustrator (wife and husband) are native Californians and were raised on ranches.